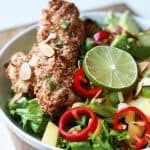 To make the Coconut Crusted Chicken: Add raw almonds and coconut flakes to a food processor, blend into small rice like pieces. Place in a small bowl. In another bowl add the white whole wheat flour, set aside. In last bowl add 1 whole egg, 1 egg white, and lime zest. Whisk until eggs are scrambled. First cover the chicken tenders with the flour, then dunk in the egg mixture, lastly add to the almond coconut mixture. Be sure to press the almond mixture into the tenders using your fingers. Place chicken tenders on a baking sheet. Bake for 25 minutes, or until juices run clear. To make the Honey Dijon Dressing: add honey and dijon mustard to a small bowl. Using a whisk stir until smooth. Set aside. Assemble the salad: Evenly distribute the following ingredients among four bowl (or add to one large salad bowl) green leaf lettuce, mango, pineapple, avocado, mini red peppers, green onions, coconut crusted chicken tenders, and fresh cilantro. Top with honey dijon dressing.